"Tzarah" commenced her showing in NSW and has been superbly groomed and handled by Ashley Oldfield. 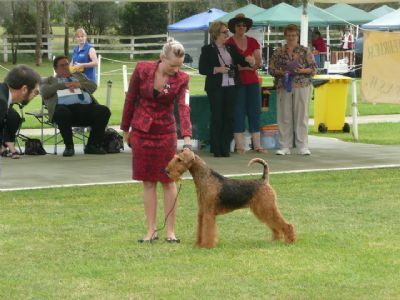 Achieving her Australian Championship Title within 3 months Tzarah achieved Runner Up Best In Show (All Breeds) and several Terrier Ingroup awards. With a superb head, neck & shoulders Tzarah has the perfect movement with her "eye catching" long strides and strong rear. A dog with lovely outgoing temperament "Tzarah" has been living happily with Welsh Terriers, Italian Greyhounds and Airedales. Thank you to Ash Oldfield & Blake Wistuba for your training, grooming and care of Tzarah. "Tzarah" is preparing for an exciting future moving to the USA in late September 2010. "Tzarah" is in the good care of Virginia Latham Smith & Deirdre Hernandez in California. 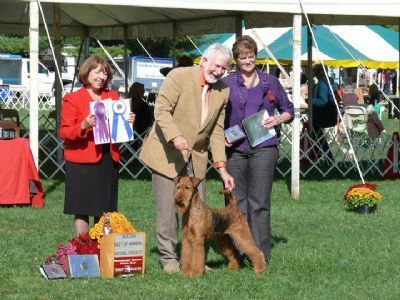 At her first weekend of shows "Tzarah" has been a "stunner" to Airedale enthusiasts from around the globe at the prestigious Hatboro K C and Montomery County K C shows. "Tzarah" was highly recognised by International judge Patricia Alsina and USA breeder judge April Clyde. "Tzarah" will be bred in the USA before returning to Australia. Puppy enquiries welcome.